Well, Pharrell is just - Pharrell! Pharrell Williams and his wife Helen Lasichanh were snapped leaving the Lowry Hotel in Manchester, England. Pharrell sported a grey hoodie from his clothing line, Billionaire Boys Club. He teamed up the hooded top with distressed jeans and a standout blue fedora hat. Of course, being Pharrell, his outfit’s statement boots were not just any old boots but ones that he had designed and crafted himself. His red boots are from his collaboration with Timberland, “Bee Line for Billionaire Boys Club x Timberland”, which are limited edition boots that went on sale last month. 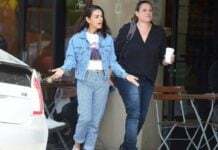 His wife, Helen, also worked a laid-back style as she teamed up a red, navy and white striped sweater with distressed jeans and her own pair of her husband’s footwear. You can find similar destructed jeans for men here.